May the Schwartz Be With You: The Schwartz's vs The First Time Mom Called, "Not it!" The Schwartz's vs The First Time Mom Called, "Not it!" Being the SAH parent I get to experience most of the good (and bad) firsts for the kids. I get to hear them say their first words before Chris. I get to smile and clap as they learn to roll over, sit up, pull up, and walk. I get to call Daddy at work and have the kids repeat whatever new words they've picked up or goofy sounds they started making. That part is tons of fun. Now the trade off is I also get the other firsts. The first time their diaper blows out and there is poop in places you didn't think possible. The first time Sarah doesn't sit back far enough on the toilet and manages to pee all over the floor. The first time the kids try to help do something in the kitchen and mommy gets to spend the next 20 minutes wiping every surface from ceiling to floor. It's all part of the job. And I take most of these firsts in stride. So when Sarah started showing interest in learning to ride a bike I was excited. She's been talking about it for probably 3 months and has even made up impromptu songs about when she learns how to ride her tricycle then mommy is going to buy her a princess bike. 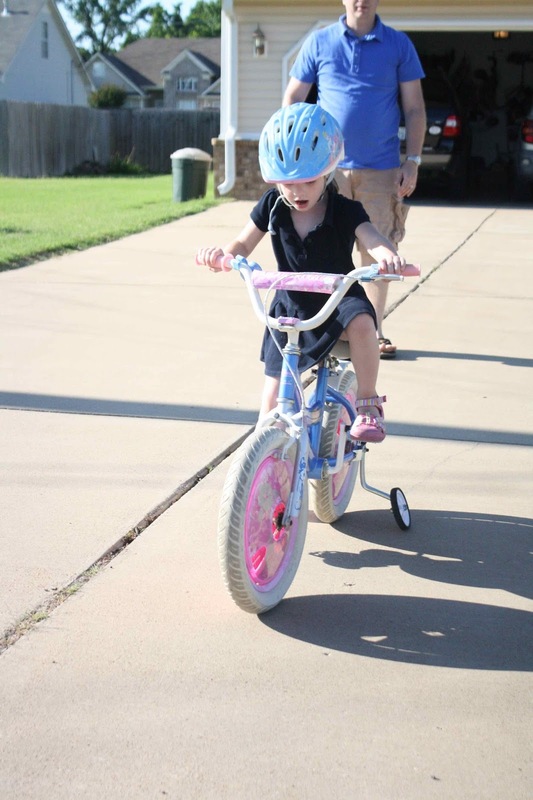 Since she finally mastered the concept of peddling on the tricycle, I started looking on Craigslist for a bike for her. 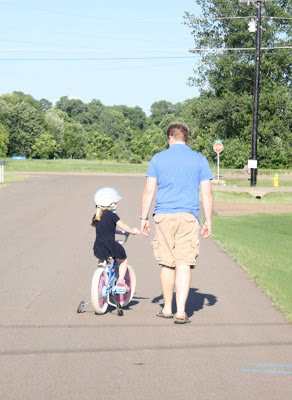 I found a good deal for a Cinderella bike that even came with a matching helmet and gave the woman a call to make sure it was still available before we headed over there after nap time. Sarah was a little intimidated by the bike at the lady's house. It's a 16" bike instead of a 12 or 14" bike that she should start on. And the training wheels weren't on their lowest setting when we first put her on the bike so it teetered and Sarah freaked out. 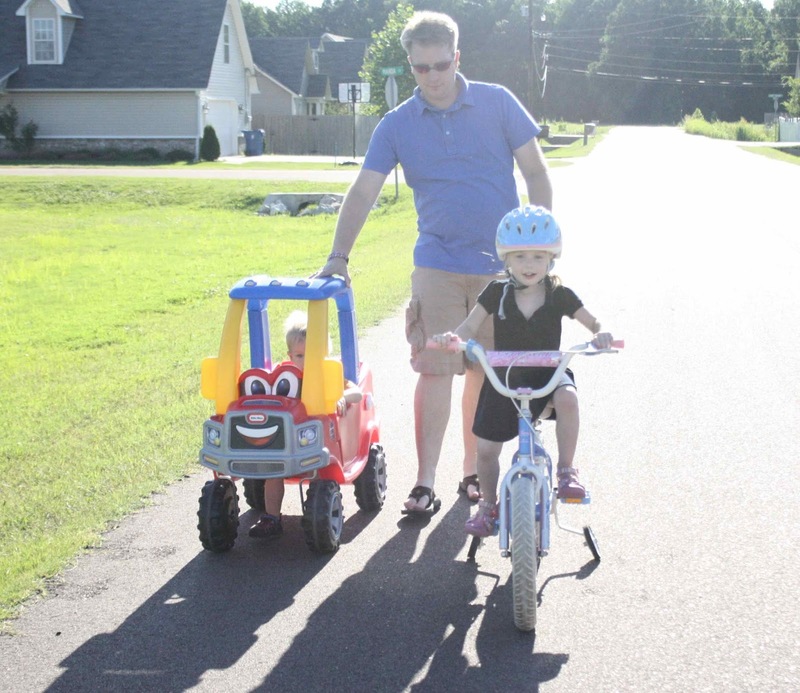 But daddy fixed that (daddy fixes everything) so we paid for the bike and headed home. Cody was a little jealous while we were at the Craigslist house so the lady also randomly sold us a red tricycle for Cody for $5. That made him very happy and he kept patting his head saying "hat" because he also wanted a helmet. 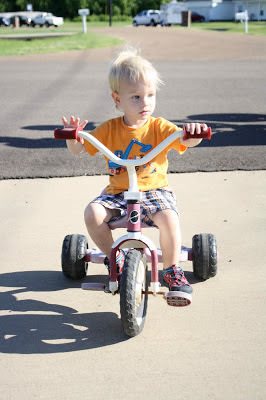 Cody can't peddle yet but he loves to sit on it and look cool. However, he won't wear the helmet that we bought him even though he insisted, "hat! hat!" The next day we set off on a family walk for Sarah to ride her bike. I'm walking beside her "helping" her. And I realize she's not peddling she's just letting me push her. So I tell her she needs to peddle-peddle-peddle and give her a little push. She peddles but not really and after the momentum I gave her wears off she stops. And we go through this time and time again, for what feels like an eternity. And then I lose it and yell, "Not it!" I am not the patient parent. It's not me. I'm the story reading, bedtime singing, snotty nose wiping, diaper changing parent. I can handle being elbow deep in multiple bodily fluids, or monotonously reading the same book over and over. But when things take lots of patience and calm repetitious explainations it's best to hand the reins over to Chris. So I just took pictures instead. And kept saying, "You're doing a great job honey!" Which was really aimed at both of them. Thank goodness she has such a wonderful daddy. It's now also going to be his job to teach her to drive. I'm already calling "not it!" on that one too. P.S. 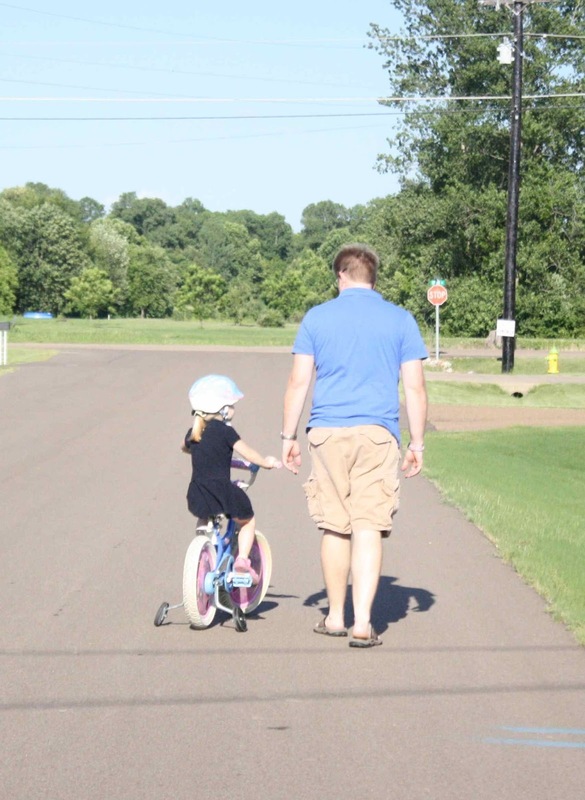 I want you to know that even on nights when Chris is in school I take her out to practice riding her bike on our nightly after dinner walks. And she does enjoy "practicing". We just can only do it for about 3 houses down and back before I'm ready to quit.